Feeling the heat of P6 exams? Get ready for Oral Exams! SA1 oral is 2 weeks away right after Good Friday! Prelims is in July and PSLE is exactly 4 months! Is your child ready? Time to get personalised uplift with practical exam-effective support! 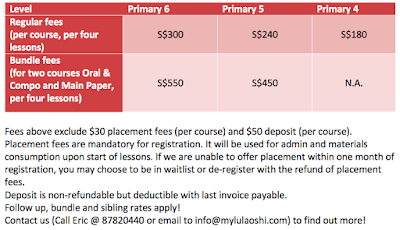 Lu Laoshi, our Chinese PSLE specialist, personally conducts 2 types of courses to target the main paper and oral & composition components in PSLE. She will be conducting a full simulated oral exam from 13 to 14 April, this coming Sat & Sun, to benchmark your child at national level. Why do we have simulated oral exams? Helps with the mental preparation of the child, reducing nervousness & stress. Helps boost the child's confidence and teaches the child to monitor and manage his stamina & energy level. Reduces chances of a common blackout during exams. Hurry! Sign up now as vacancies are limited. Saturday 4.30 - 6.30pm (4 to 4.30pm free consultation) - FULL!! Sunday 4.30 to 6.30pm (4 to 4.30pm free consultation) - FULL! Contact us to find out more about our other programs! Register online for our courses!